Berry writes to inquire about a check sent by Worcester and to thank her for her help and interest in Berry. She shares that the Silver Anniversary will be celebrated this year and hopes that every friend of Berry's will be present on that day. 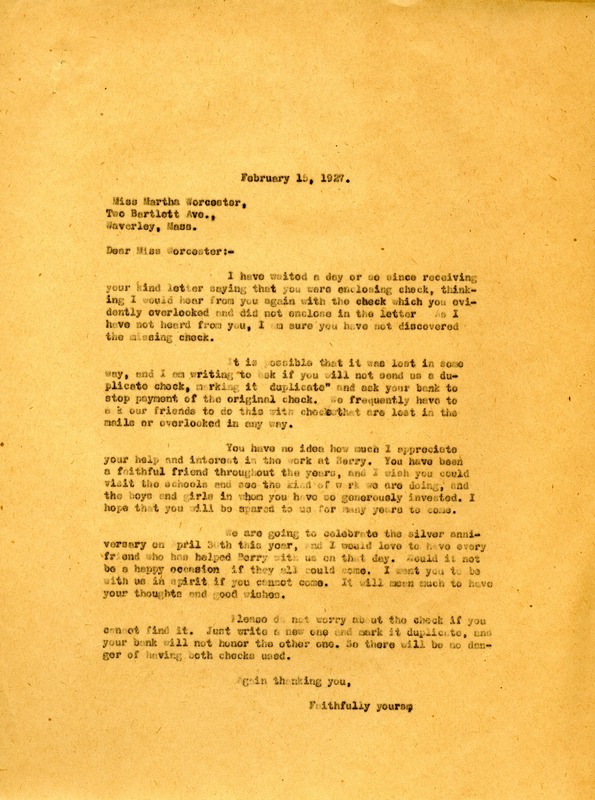 Miss Martha Berry, “Letter to Martha Worcester from Martha Berry.” Martha Berry Digital Archive. Eds. Schlitz, Stephanie A., Rachel Renaud, et al. Mount Berry: Berry College, 2012. accessed April 20, 2019, https://mbda.berry.edu/items/show/6214.